Solid-State Drive (SSD) prices are continuing to drop and capacities are increasing, so more and more gamers are looking to install games on an SSD over a traditional spinning hard drive. One of the first things that a gamer will notice when moving from a hard drive to an SSD are reduced loading time in games between menus and cut scenes. Games will also install faster and some might actually see a graphical performance improvement by going with an SSD! Some systems will see a less hitching and stuttering thanks to an SSD upgrade if the old drives transfer speeds were low enough to bottleneck performance. In the rarest of occasions we have found a Frames Per Second (FPS) increase, but that really depends on how some game titles are streaming textures. Over the years we’ve tried to include game load times in our storage drive benchmarks, but it is tough. If you are comparing just one HDD to an SSD the benchmarks are easy, but when you are comparing a dozen or more drives to one another it gets tough. It’s something that can easily be done to show the differences between technologies or interfaces, but if you look at just SATA III SSDs that are all basically interface limited the drives will all be clustered together in the chart and the performance differences message gets lost. 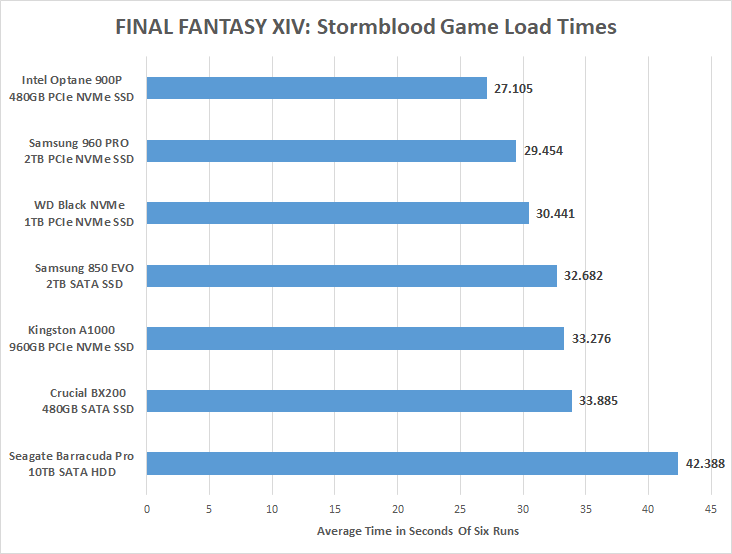 We recently gave game load time testing a shot with FINAL FANTASY XIV: Stormblood (landing page) that came out in June 2017 and the results were rather interesting. We used our normal SSD benchmark test system (details) which features an ASUS ROG STRIX Z370-F Gaming Motherboard with an Intel Core i5-8400 6-core ‘Coffee Lake’ processor running Windows 10 64-bit. Many gamers have their gaming PC configured with an SSD for a boot drive and a hard drive for mass storage. Therefore the first performance test we ran was on the Seagate Barracuda Pro 10TB hard drive ($349.98 shipped) and this 7200RPM SATA III 3.5-inch internal hard drive averaged 42.388 seconds game load times on FINAL FANTASY XIV: Stormblood. This is our baseline performance number, so next we tested the ‘old’ circa 2015 Crucial BX200 value SATA III SSD that featured 2D Planer TLC NAND Flash memory. Game load times improved to 33.885 seconds by moving from a HDD to an SSD, which is an improvement of just over 20%. This is the significant performance increase that most gamers sense when they upgrade to an SSD for the very first time. We then ran a 2TB drive from the worlds best selling SSD series, which is the Sasmung SSD 850 EVO. This drive series uses Samsung V-NAND (3D TLC NAND) and we saw performance improve once again, but not to the degree that we saw from moving from a HDD to an SSD. We are seeing about a 23% improvement over the HDD, but only about 4% over the Crucial BX200 series drive. The Samsung SSD 850 EVO 2TB drive runs $749.99 shipped, which puts it out of reach for many despite costing under $0.38 per GB. The good news is that the Samsung SSD 850 EVO 500GB drive has similar performance is only $154 shipped or $0.31 per GB. Next, we tested four PCIe NVMe drives to see how they would perform over SATA III SSDs. First up we have the Kingston A1000 that is a value drive series was just released here in 2018. The 1TB model that we tested performed about half a second better than the Crucial BX200, but was actually slower than the Samsung SSD 850 EVO drive. PCIe NVMe drives look great on paper, but this just goes to show that PCIe NVMe drives might not be better than SATA III drives for gamers when it comes to load times. This is also why when some users upgrade from a SATA III SSD to a PCIe NVMe SSD that they don’t notice any difference. That said, the Samsung SSD 960 PRO and Western Digital WD Black NVMe enthusiast class drives showed some nice performance gains. 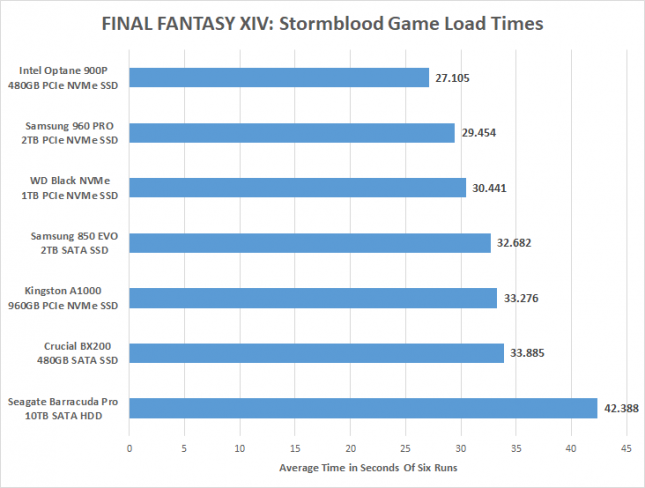 The Samsung SSD 960 PRO 2TB ($1,199.00) loaded Final Fantasy XIV: Stormblood almost 31% faster than the hard drive and was 13% faster than the Crucial BX200. The WD Black NVMe 1TB drive ($449.99 when released in late April 2018) came in almost exactly one second behind the 960 PRO 2TB drive. The Intel Optane SSD 900P Series was the winner in the game load test. The Intel Optane 900P 480GB PCIe NVMe SSD with 3D XPoint was found to be 36% faster than the Seagate Barracuda Pro 10TB SATA III hard drive and 20% faster than the Crucial BX200 series SATA III SSD. The Optane 900P 480GB drive ($612.32 shipped) has the highest price per GB at $1.28, but it does have the best game loading performance. Taking seven drives off the shelf and running game load time testing was fun and we are thinking about adding this test to our storage test suite. What do you think? If you like this type of testing be sure to leave a comment below and let us know one way or another. We might not include every drive tested in the chart as it will muddy up quickly, but we find this to be an interesting real world data point. It’s seldom done by reviewers due to the amount of time it takes and the public doesn’t do it because they don’t have the budget to gather a group of drives like this together (our seven drives add up to just about $4,000). 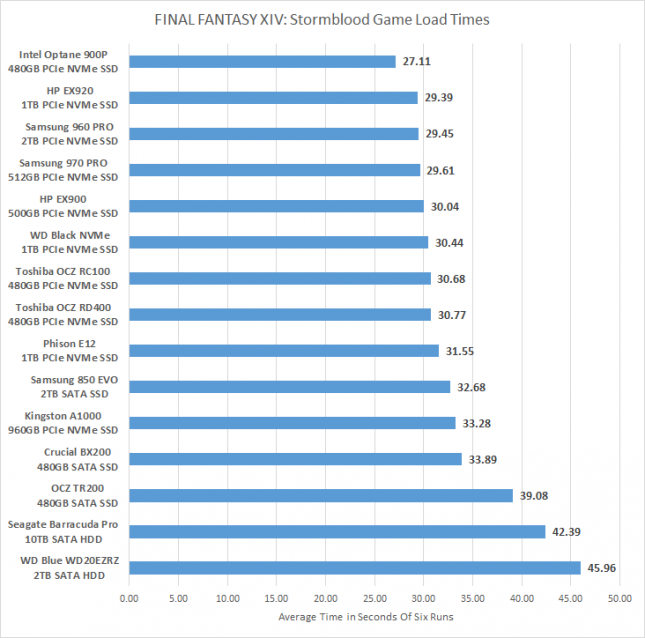 Update #1 – July 2018 – We have tested additional drives since posting this article, so here is the latest game load time result chart with even more drives included!